Enter text for the feedback prompt in the field at the top of the window, or copy and paste it from another source. Use the buttons in the upper left corner to add formatting and hyperlinks to your text. Tip: You'll need to install a right-to-left keyboard input language in Windows to see the Right-to-Left Text Direction button on the Feedback window. Use the buttons in the lower left corner of the window to add and edit audio. Record: Click this button to record narration for the feedback prompt. Click it again to stop recording. Rewind: Click this button to start over when you're previewing recorded or imported audio. Play/Pause: Click this button to play (preview) your audio. Click it again to pause playback. Delete: Click this button to delete recorded or imported audio for the feedback prompt. Import: Click this button to import an audio file. 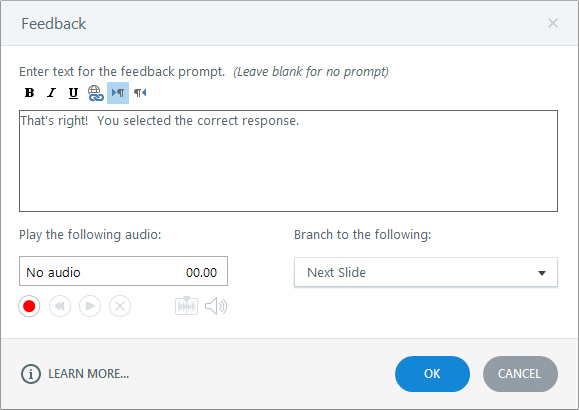 Use the branching drop-down to choose what will happen when learners advance past the current slide.